Manager’s Agenda #3. A communication transmitted from Louis A. DePasquale, City Manager, relative to an update on the drought conditions. Manager’s Agenda #5. A communication transmitted from Louis A. DePasquale, City Manager, relative to various projects and initiatives related to the City’s Bicycle Safety Work Plan. There definitely are some modifications to street configuration and on-street parking that can be made for greater bicycle safety, but this is best done in conjunction with a thoughtful process involving all stakeholders – and not with the banging of drums. It is worth noting that at a recent City Council committee meeting on a possible increase in the cost of a resident parking permit, one councillor clearly stated that she hoped that by jacking the sticker price up sufficiently high it would lead to enough people giving up their vehicles so that parking could be eliminated from most or all of Broadway, Cambridge Street, Hampshire Street and Massachusetts Avenue. She especially liked that Uber vehicles would more easily be able to pick up passengers on these streets. Public process may be time-consuming, but it’s far preferable to a dictatorial City Council. Manager’s Agenda #6. A communication transmitted from Louis A. DePasquale, City Manager, relative to the zoning amendments with recommended changes to the Inclusionary Housing Provisions. Perhaps most of the slate should be wiped clean, but maybe councillors should be afforded the privilege of selecting a few or the more substantial requests for retention on the list. While they’re at it, we could also use a little Fall Cleaning of some of the items that are On the Table collecting dust and going nowhere. The City Clerk will, I’m sure, appreciate the gesture. As an exercise, let’s separate out the substance of these Sanctuary City resolutions from all the other statements of conditions, causes, and virtue. Those were some pretty substantial statements in 1985, but they really aren’t all that severe. In a nutshell, they basically say that the City of Cambridge won’t carry out the work of the federal government in carrying out a policy with which the City of Cambridge has great disagreement. The federal government doesn’t round up people who have failed to pay parking tickets while in the City of Cambridge, so this is, in some respects, just a statement that we’ll do our jobs and the federal government can do their jobs. What is insidious about the current situation is the threat of federal funds being withheld to any city choosing to not do the job of federal authorities. That’s almost like saying that we’re going to withhold your paycheck until you do your boss’s job in addition to your own. 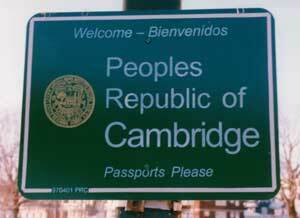 Cambridge residents pay federal taxes (sorry, you can’t claim the Peoples Republic of Cambridge as a sovereign state), so federal funding is really just a mechanism through which we get back some of our own money. What is most offensive is the manner in which the federal government attempts to micromanage local communities via the threat of withholding federal funds that they have extracted from residents of those same communities via taxation. This practice has been growing for years and is not particular to the latest dispute over Sanctuary Cities. Even President Obama threatened to withhold educational funds based on failure to reconfigure bathrooms, and there are plenty of other examples of federal authorities using taxation as a means of dictating policy. So, the question I have is simply this: What aspects of Cambridge’s Sanctuary City resolutions are actually in violation of federal law? Indeed, the last statement of the 1985 resolution states quite clearly that "the provisions of this Resolution shall be severable, and if any phrase, clause, sentence or provision of this Resolution is declared by a court of component jurisdiction to be contrary to the Constitution of the United States or of the Commonwealth or the applicability thereof to any agency, person or circumstances is held invalid, the validity of the remainder of this Resolution and the applicability thereof to any other agency, person or circumstances shall not be affected thereby." I’m not exactly sure who wrote the text of this proposed surveillance ordinance, but I’m pretty sure he wears a tin foil hat. The more I hear about this the better I feel about how the City and the Cambridge Redevelopment Authority came to this point. It seems as though every piece of real estate for which the City Council has some control has become a political football in a game in which All Great Things ride on the outcome. The Foundry is, at the end of the day, just another building. The City has lots of buildings serving community purposes, including multiple Youth Centers and all of the Community Schools programs. While everybody stamps their feet about The Foundry, where is the fervor about all of these other City programs and facilities? Perhaps the best thing would be to start viewing The Foundry as just another asset in an enlarged inventory of facilities. Maybe then we could start thinking less selfishly and more holistically. 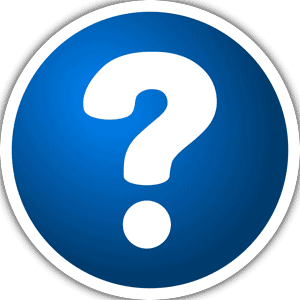 When was the last time the City Council and the School Committee looked at the bigger picture and asked if we’re making the most of all of the City’s assets? Nov 9, 2016 – The Cambridge Chamber of Commerce today announced that David Maher, Cambridge City Councilor and former two term Mayor of Cambridge, has been selected to be the Chamber’s next President and Chief Executive Officer. Maher will assume leadership of the Cambridge Chamber, one of the largest business organizations in New England, in early December. He will not seek re-election to the Cambridge City Council in 2017. 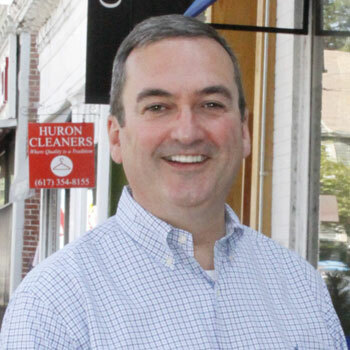 Maher brings deep ties to Cambridge’s business, civic and political communities. In addition to serving as a City Councilor and Mayor, he also served as School Committee Member and School Committee Chair. Most recently, Maher oversaw the search and selection process for the City’s new City Manager and Superintendent of Schools. In the private sector, Maher has also worked for over 20 years as Director of Development & Public Relations for Cambridge Family & Children’s Service, one of Cambridge’s oldest human service agencies and spearheaded an ambitious capital campaign to further the agency’s mission. Maher’s selection was applauded by local leaders. “With a dynamic public background and strong private sector experience, David will excel in this new role and enrich the partnerships at the Cambridge Chamber of Commerce,” said Biogen Foundation Executive Director Chris Barr, who headed the search process for Chamber President. Maher, a graduate of Suffolk University, was born, raised and resides in the City. Manager’s Agenda #10. A communication transmitted from Lisa C. Peterson, Acting City Manager, requesting the City Council accept Chapter 218 of the Acts of 2016, “An Act Modernizing Municipal Finance and Government”, Sections 193 and 194 giving municipalities the authority to reduce speed limits on all ways other than state highways. You may recall that not long ago the City Council hastily voted to reduce the speed limit to 20mph citywide. This led to a thoughtful response from the Dept. of Traffic, Parking, and Transportation recommending a citywide limit of 25mph with a lower speed limit for legitimate "safety zones" (as was the intent of the state enabling legislation). The City Council was also alerted at that time to the fact that any change had to wait until the new state law went into effect before adopting its provisions. That time has now arrived and we’ll shortly be seeing a 25mph limit in Boston, Somerville, Cambridge, and likely other places. Manager’s Agenda #11. A communication transmitted from Lisa C. Peterson, Acting City Manager, relative to Council Order No. 15, dated Oct 31, 2016, regarding a Request for Proposal for consultant services related to the visioning, programming, governance, and re-purposing of the Harvard Square Kiosk as well as creating a Harvard Square Kiosk Working Group. In the Foundry matter, the City Council voted to allow the Cambridge Redevelopment Authority to shepherd the process leading to the selection of bidder who promises to achieve both the programmatic and financial goals specified by both the City Council and the Cambridge Redevelopment Authority. Now some city councillors want to go back to the drawing board and change the goals in such a way that the City’s costs to operate this "gift" from Alexandria Real Estate will be substantially increased. Every few years there’s some kind of movement to allow non-citizens to vote in Cambridge municipal elections. This Order makes statements like "non-citizens … are presently barred from formally voicing their opinions" that are clearly misleading. The Order also fails to note that any non-citizen living in Cambridge is a citizen of some country and generally is able to vote in those elections. Home rule petitions from Cambridge and elsewhere have been filed before and have not been approved. I certainly hope this is not approved either, but the Order also apparently seeks some kind of legal loophole that would allow non-citizen voting without any state approval. I seriously doubt if that is possible. In matters like voting it’s best to have uniformity across all cities and towns in Massachusetts in terms of eligibility to vote in all elections. In reading this report I was glad to see that some City staff were taking a more thoughtful and measured approach than some city councillors. There is a lot of room for discussion and alternatives than just the blitzkrieg of orders introduced at the Oct 17 City Council meeting. I also hope that our elected officials can be educated about the difference between actual safety measures and politically expedient actions that don’t address the acual causes of cycling fatalities and injuries. It appears that Louis DePasquale’s first day of work in his new role as City Manager will be Monday, Nov 14, 2016 and his contract will extend through Jan 8, 2021. 1. Continuation of the work in behalf of the extension of the Merit System of Appointments to Heads of Departments. This work has been vigorously pushed preparatory to securing favorable legislation from our next Slate Legislature. In response to a request for the co-operation of our City Council a hearing was recently granted by a joint committee of the Board of Aldermen and Common Council, at which Messrs. Richard H. Dana, Alvin F. Sortwell, and Dr. Edward R. Cogswell made carefully prepared arguments in favor of the plan. 2. Continuation of the work of the Educational Committee in behalf of the better preparation for citizenship by our Public Schools. Every public school in Cambridge has been visited by some member of this committee, and the sympathetic co-operation of the Masters has been secured. The School Committee has shown its interest in this work by emphasizing its importance and increasing the time allotted to the subject in its proposed new Course of Study. In order to secure still further co-operation, the Superintendent of Schools, Mr. Francis Cogswell, issued a call to all the public school teachers to meet the Educational Committee on May 25. This joint meeting was presided over by Mr. A.M. Howe, the Chairman of the Educational Committee, and was addressed by President Charles W. Eliot, who is a member of the Committee, and by Masters Grover, Billings, Bates and Morse. It was voted to invite the Superintendent of Schools to appoint a Committee of Masters and League Members to help carry on the work. 3. Revision of our City Charter. A committee of ten (or more) citizens, made up principally of men who have had wide experience at City Hall, under the chairmanship of ex-Mayor Alvin F. Sortwell, will give special study to this subject and will report what changes, if any, should in their opinion be made in our City Charter. 4. The City Election of 1904. On May 19, 1904, the Executive Committee voted to announce that shortly before the next municipal election it intends to furnish as complete and impartial information about all the candidates as it is able to obtain. When such information is full and sufficient, it intends to draw conclusions and designate any candidates whom it considers fit or unfit for office. When two or more candidates for the same office appear to be equally qualified, it will so state, and in case not enough information about a candidate can be obtained to enable the Committee to form a just conclusion, it will print only the facts without comment. No material fact about a candidate which has any bearing on his fitness or unfitness for office will be suppressed, and all candidates will be treated alike. It will be the aim of the Executive Committee to give the information about candidates in clear and convenient form. The Secretary of the League will have charge of this work, as last year, and solicits the aid of all members. HENRY N. WHEELER, Chairman. ROBERT WALCOTT, Secretary. JOSEPH H. BEALE, Jr. RICHARD HENRY DANA. ALEXANDER H. BILL ARCHIBALD M. HOWE. LOUIS R. COBB. EDMUND REARDON. EDWARD R. COGSWELL WILLARD REED. GEORGE HOWLAND COX. HUNTINGTON SAVILLE. President of the Good Government League of Cambridge, Mass. A GLANCE at the early history of Cambridge reveals many similarities between the civic problems of the seventeenth and the twentieth centuries, and points out that most of the roots of the good and the evil in our institutions began their growth between two and three hundred years ago. In Young’s "Chronicles” we read – in regard to the prevention of fire in dwellings in 1631, the year after New Towne, now Cambridge, began its existence: "For the prevention whereof in our new town . . . we have ordered that no man shall build his chimney with wood." We are told that in 1632 the Court of Assistants imposed a tax of sixty pounds sterling upon "the several plantations within the lymitts of this pattent towards the making of a pallysadoe about the New Towne." The palisado has gone, but in place of it we have a parkway, for the construction and maintenance of which taxes are now imposed. In 1639 Stephen Daye set up in Cambridge the first printing press in America north of Mexico, and the General Court enacted a law that no printing should be done in the colonies except in Cambridge. Mr. H. O. Houghton, the founder of the Riverside Press, used to say that the Daye Press died from lack of competition, and that it was not until this legislative ban was removed that the art of printing began to make progress in the colonies. The evil custom then begun of legislating for the benefit of individuals or corporations still exists. We read that in 1645 "every family in each of the colonies gave to the college at Cambridge 12 pence, or a peck of corn, or its value in unadulterated wampumpeag"; and that the college in return exerted a powerful influence in forming the early character of the country. Our community is still contributing to the cause of education, and a committee of our Good Government League is trying to find out whether our contributions still tend to form character. Mr. Fiske says: "We find that in 1652 the townsmen do grant liberty to Andrew Belcher to sell bread and beer for entertainment of strangers and the good of the town." This same Belcher family continues to sell bread in Cambridge, but whether it may sell beer is a question in reply to which the voters now say Yes or No each year. In 1655 President Dunster of Harvard was censured by the magistrates and dismissed from office for what was styled his damnable heresy, that infant baptism was unscriptural. "The magistrates" no longer have control over a Harvard president, but only a few years ago a president of a nearby university was led to move farther West on account of his views on the silver question. In March, 1846, Cambridge became a city, but she did not adopt then, and has not yet adopted, the scientific, businesslike, and economical methods of work which characterize the private business of her own citizens, and which have been long in vogue in the cities of Great Britain and Continental Europe. Cambridge has probably suffered less, however, from remissness in these directions than has any other American city, and we who live in Cambridge believe that on the whole she has done more for her people than has any other American city, and that Cambridge is the best city in the world to live in, to rear a family in, and to die in. The salvation of our city has been the fact that she has always had among her citizens an unusually large number of able, public-spirited men, of knowledge, common sense, and experience, who, whenever occasion has demanded it, have given generously of their time, strength, and money. That they have not been better represented in our City Council is the fault of our municipal system; that they have initiated improvements which our city has been glad to adopt, and that they have served long and faithfully on committees and commissions which are not subject to the fickle changes of annual elections, is well known. Let me cite a few illustrations. On a list of those who have served as members of our School Committee may be found: Alexander Agassiz; Prof. Francis Bowen; W. S. Chaplin, now chancellor of Washington and Lee University ; Prof. F. J. Child; Prof. Ephraim Emerton; Pres. C. C. Felton; Prof. W. W. Goodwin; Prof. A. B. Hart; Col. T. W. Higginson; Miss A. M. Longfellow; Rev. Alexander McKenzie; Prof. Charles Eliot Norton; Rev. Fr. John O’Brien; Dr. A. P. Peabody; Horace E. Scudder; Prof. F. W. Taussig; and Dr. Morrill Wyman. With these and others notable as scholars and teachers have served also some of the ablest business men of our city. For twenty-five consecutive years the late Chester W. Kingsley, one of our ablest and most esteemed citizens, served on our Water Board, of which he was the chairman for fourteen years. For thirty-seven consecutive years Mr. George S. Saunders served faithfully and well as a cemetery commissioner. His brother, Charles H. Saunders, served twenty-five years as a commissioner of our Sinking Fund. Mr. George H. Cox has served continuously on our Park Commission since its formation eleven years ago, and has just accepted a reappointment for three years. These are only a few of the many instances that might be quoted of long, able, and faithful public service. In 1648 and 1669 the first two schoolhouses in Cambridge were built and conducted at private expense. In 1888 our Manual Training School was founded by our fellow-citizen, F. H. Rindge, who also paid all its running expenses up to 1900, when it was taken over by our city. For eleven years before they came under the care of our School Committee, free kindergartens were maintained by Mrs. Quincy Shaw and other Cambridge women. Vacation schools were conducted by private subscription before the city was ready to assume the burden of maintaining them. The Cambridge Public Library was also started through private munificence. The Associated Charities, organized in 1881. In addition to its regular work it has exterminated the tramp nuisance; it has done away with the chattel mortgage evil, which was making nearly five hundred of our poor families pay from fifty to one hundred and twenty per cent a year on small loans; it has established nine stamp savings stations for children, which show a record of over seven thousand depositors; and it has aided in almost every other charitable work done in the city. The Prospect Union and the Social Union: These organizations have supplied numerous courses of instruction, principally by Harvard students, at nominal rates to hundreds of working people each year. The East End Christian Union, with library, gymnasium, bath-rooms, workshops, etc. The Avon Home for Destitute Children. The Cambridge Hospital, at an annual expense of over $20,000. The Holy Ghost Hospital, recently aided by the united efforts of many of the women of Cambridge. Perhaps the best illustration of co-operative work is the No-License movement, which has resulted in a ”No" vote for eighteen years in succession. Among the ablest workers in this cause may be mentioned Rev. D. N. Beach and Rev. Fr. Thomas Scully. Good work was done in the winter of 1902-3, throughout the scarcity-of-coal period, by the Citizens’ Fuel Committee. It at once restored confidence to frightened citizens, and, while it urged them to look out for themselves so far as possible, and did not become a relief committee, it was able to deliver coal promptly in small quantities to every applicant. Among the workers on this committee were John H. Corcoran, J. H. H. McNamee (then Mayor), A. M. Howe, President C. W. Eliot, and Bishop William Lawrence. Although the adoption of a city charter in 1846 produced the usual result, namely, the introduction of national politics into municipal affairs, we find that as early as 1854 there was a meeting of citizens who believed that party politics should not be a test of qualification for municipal offices. It was not until 1866, however, that all municipal nominations began to be made on a non-partisan basis; and this state of affairs continued until the fall campaign of 1901. Of the origin of the association we glean the following information from a report of Mr. George G. Wright. In 1889, after the nomination by caucuses of many unfit candidates for office, there was a meeting, in the rooms formerly occupied by the Public Library, of those opposed to such candidates. A new list of candidates endorsed at this meeting was presented to the voters, under the title of " The Library Hall Candidates." After a hard contest the objectionable candidates were defeated, and all but four of the forty-three Library Hall candidates were elected. This meeting led to the formation of the Library Hall Association. The purposes of this Association shall be to secure the nomination and election of proper candidates for municipal offices; to procure the punishment of all persons who may be guilty of election frauds, maladministration of office, or misappropriation of public funds; to advocate and promote a public service based upon character and capability only; and to promote intelligent discussion of municipal affairs by the publication and distribution of reliable information in relation thereto." During the first eleven years of its life over eighty-eight per cent of its endorsements were ratified at the polls. Candidates for office who were members received no more consideration than those who were not, and in many cases the association endorsed candidates who were not members in preference to those who were. Its action in one case resulted in the election of a candidate for Mayor who was not a member and the defeat of another who had been a member of its own Executive Committee the same year. For several years Library Hall prepared and published a record of the acts of each member of the City Council, including attendance at meetings. It nipped in the bud the beginnings of corruption by calling public attention to the excessive number of car tickets used at the city’s expense by some of the members of the City Council, and the use by members of the labor patronage of public service corporations. Members of the Executive Committee attended the meetings of the City Council, and made reports on what they saw and heard. The Library Hall Association became at length so large that its method of endorsing candidates was thought unsatisfactory. It was claimed that it was impossible at a single meeting of three hundred or more members to discuss the merits and demerits of candidates thoroughly enough to ensure a vote for the best men. 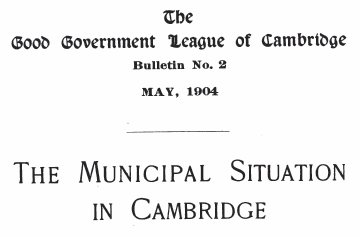 It therefore decided to change its method of work and to intrust the management of its business to a committee, and to change its name to the Good Government League of Cambridge. This decision was hastened by the appearance, in the fall of 1901, of the Democratic party in city affairs, and, in 1902, of a regular Non-Partisan party in opposition to it. In the fall elections of 1901 and 1902 the Democrats were successful, and were therefore in power in 1902 and in 1903; in the fall of 1903 the Non-Partisans won. While the partisan party in Cambridge calls itself the Democratic party, it might more properly be called the Opposition party. It was formed to oppose those whom it regarded as in control at City Hall, and to secure control for itself. That its politics were local rather than national would appear from the fact that its leader at first advised against choosing its present name. Some Republicans were induced to join its ranks, and many Democrats refrained from doing so. The present Non-Partisan Mayor is a Democrat; the first leader of the Non-Partisan party was a Democrat; and a large minority of the Executive Committee of Library Hall which failed to endorse any of the so-called Democratic candidates for office in 1901 were Democrats. That partisanship is not believed in by all its members is shown by the fact that one of its ablest supporters recently said in a public speech that non-partisanship in its true sense is an ideal form of government. His reason for becoming a partisan being his belief that the present non-partisan administration is not representative of true non-partisan ideals. The contest between the Democratic and Non-Partisan parties is a bitter struggle for power. This struggle consumes annually months of time and thousands of dollars. From the nature of the case there is little time or strength left for the perfection of a system by the aid of which the business of the city may be best performed. Even the public-spirited citizens who have accomplished the good results I have spoken of have not yet waked up to the necessity of constructing proper municipal machinery. Let us rather regard the American idea of to-day as that progressive idea· which has achieved success in innumerable private undertakings and which can and should be applied to municipal affairs. This progressive idea, however, has not yet found its way into our city charter. Our charter says that "all officers of the city not elected by the qualified voters shall be resident citizens of the city of Cambridge." What private institution or private business of Cambridge would ever hamper itself by such an unAmerican suicidal requirement as this? In 1864 one of our citizens went abroad and brought back with him the best workmen he could find, and largely by their aid built up a business which to-day pays heavy taxes to the city and supports hundreds of our most respectable citizens. President Eliot has drawn his professors from all parts of the world; had he not been allowed to do this, would he have increased the number of Harvard’s students from 1,059 to 4,328 in the thirty-five years that he has been president? In the same section with this demoralizing requirement, power is given to the Mayor, subject to the confirmation of the Aldermen, elected at the same time with himself, to make appointments to salaried offices without any provision being made for ascertaining their fitness for the work which they are to perform. In regard to a Mayor’s appointments being "subject to confirmation by the Board of Aldermen," Dr. Albert Shaw says: " The Council’s power of rejecting appointees nominated by the Mayor very considerably diminishes his responsibility for the proper exercise of the appointing power …. The relation between the two cannot at best be other than that of a shifting, unprofitable and illogical compromise." One of the best mayors we ever had once said to me, " I would have removed Mr. A., who was incompetent, if I could have gotten the Aldermen to sustain me." This means that the party will of an unpartisan Board of Aldermen was a block to efficient service. All of these charter provisions make for partisanship: First, a Mayor cannot appoint the best man if he lives outside the city limits; second, he is not required to apply any test of fitness; and third, he must appoint only those who can get the votes of Aldermen, who naturally and honestly perhaps feel that they represent constituencies. Our charter also requires that the Mayor and City Council shall be elected annually. They are elected in December; they are inducted into office in January, and a month later, without experience, except in the case of re-elections, and usually without knowledge of such matters, they pass on a city budget which calls for the expenditure of over $3,000,000 of the taxpayers’ money. Is it an American business principle for a corporation to intrust matters of such importance to a set of workers of one month’s standing? We are told that it takes a Mayor or member of the City Council five months to learn even the routine of his office, and that if he is to retain his position he must devote four months to the work of securing his re-election. This leaves him the three vacation months, often partly spent by him away from home, in which to attend comparatively unhampered to the requirements of his oath of office. Our city charter also calls for a two-chambered City Council, a requirement which only adds to the inefficiency already so well provided for. Our city charter by its division of power among the three branches of the city government deprives each branch of a proper sense of responsibility and puts stumbling-blocks in the way of progress. Last year vacancies in the Overseers of the Poor were not filled for months because the Board of Aldermen and the Common Council could not decide whether to act conjointly or concurrently. This month a two-thirds vote of the Common Council, for a much-needed water loan, could not be obtained because some of the Councilmen, though favoring the loan, would not vote for it without a guarantee that only Cambridge citizens should be employed by the Water Board. This obstruction has already cost the city thousands of dollars, through a rise in the cost of material, and has made more imminent a feared water famine. Should the required guarantee be given the added cost for labor alone would amount to $150,000, or from thirty to forty per cent. This illustrates the evils of a division of power and the ability of a misguided minority of a useless third branch of our city government, regardless of their oaths of office, to sacrifice the needs of all our citizens to the chance of getting positions for a few of them, which sound business policy might require the Water Board to give to others. Can it be a matter of surprise that under our present charter many of our best and most experienced men, who are willing to put their shoulders to the wheel and to sink their hands deep down into their pockets in behalf of a specific municipal improvement, are unwilling to become candidates for the Common Council or Board of Aldermen? Instead of securing, as we should in a community like ours, men the market value of whose business ability and experience is high, – as high, for example, as that of solicitors of municipal concessions with whom they carry on an unequal contest, – we get men whose average market value is low. While excellent young men sometimes become members, they almost always retire as soon as they have acquired ability and experience enough to warrant private citizens in intrusting them with matters of importance. We want such men, but we want them after they have gained some experience in affairs rather than before. We are told that partisanship is the source of all that is bad in municipal affairs, but the root of our municipal evils lies deeper than partisanship; it lies in our unsound, unbusinesslike, demoralizing municipal system, which produces and fosters partisanship even in a party which honestly tries to be non-partisan. If neither of the existing municipal parties can be induced to take up the question of reform in our system, then let us have a third party with a platform which will challenge the common sense, intelligence, and public spirit of our people. Our present system, however, instead of being a source of despondency is a source of hope, for it is so unsound, so unbusinesslike, so unscientific, so sure to produce unbearable inefficiency and high taxes, that the public spirit of Cambridge, the Cambridge idea as it is sometimes called, will surely come to the rescue. The business principles in vogue in our private affairs and in the municipal affairs of foreign cities can and will be introduced into the management of the affairs of American cities. Dr. Shaw tells us in regard to filling offices in Great Britain: " It is usual to advertise for a vacancy …. If a chief of police is wanted for a town, even of a moderate size, there are likely to be applicants by the score or hundred from all parts of the United Kingdom." A reference to the experience of France and Germany would only confirm the thought that it is not at all impossible to establish a system of appointment by which merit shall be the only "pull." Such a system neither cheats the public nor degrades the wage-earner. While the objects of the Good Government League are the same as those of its predecessor, the Library Hall Association, it has devoted itself principally during the past year to the promotion of a study and discussion of questions relating to the improvement of our municipal system. Its first recommendation favored the extension of the Merit System to the appointment of heads of departments. In behalf of this recommendation, Mr. R. H. Dana, a member of the Executive Committee of the League, prepared a paper which the League has published as one of its bulletins. This paper was read and discussed at the last annual meeting of the National Civil Service Reform League, and the subject has been discussed in Cambridge whenever an opportunity has presented itself. It is hoped that the legislation necessary to bring about this reform will be secured from our next State Legislature. A line of work which has for its aim the better preparation for citizenship by our public schools is being carried on by a committee of the League, of which President C. W. Eliot is a member. Every public school in Cambridge has been visited by some member of this committee; these visits of inquiry have, it is believed, already lead to an increased interest in the subject on the part of teachers and pupils, and the interest of the Librarian of the Public Library has been secured in the direction of obtaining and bringing to the attention of teachers and pupils the best books on the subject. When the report of the committee is presented, it will surely contain helpful suggestions. 1. The continuation of the work already begun in regard to the extension of the Merit System and to securing a better preparation for citizenship by our public schools. 2. An early study and discussion of the question of lengthening the terms of office of the Mayor and members of the City Council. 3. A study of the advisability of a single chambered City Council. 4. A careful study of the relationship between the city and the public service corporations which use its streets, whether the use of our streets for private gain should not be paid for at the same rates that the city would have to pay for a similar use of private property; and whether the city should ever grant irrevocable rights to the use of its property. 5. A study of our city charter with a view to finding out what changes should be made in it, that the management of our city affairs may become more economical, more businesslike, and more efficient. Most of these suggestions have already been taken up. Mr. Louis D. Brandeis of Boston recently delivered to members of the League and others a most helpful address on "The Legal Rights of Public Service Corporations in Our Streets," which will be published shortly as one of the League’s bulletins, and a meeting has been held at which the question of lengthening the terms of service of the Mayor and Aldermen was discussed. Among other lines of work may be mentioned a public protest from the Executive Committee against the hold up of the water loan, to which I have referred, and the publication of impartial information about candidates for office just previous to the last city election. More stress has been laid upon measures than upon men, because an improvement in our system is a permanent change for the better and tends to produce good men, while a contest over men alone has to be fought over again every year. "All publications and recommendations shall be over the signatures of the members of the committee issuing such information or making such recommendations." It will be seen therefore that since this paper bears only my own signature neither the League nor its Executive Committee is in any way responsible for any of the heresies to be found in it.